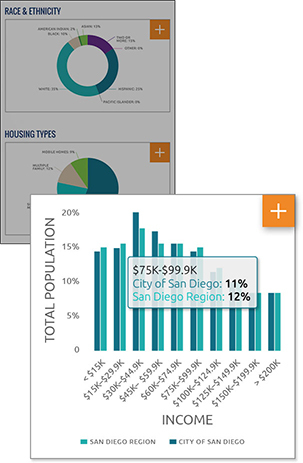 In a few simple steps you can find, interact with and export specific census, estimated or forecasted information and reports about the San Diego region. Read each step to learn how to use Data Surfer. 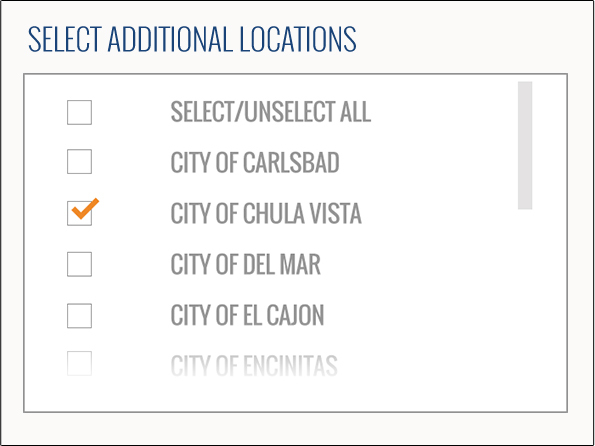 SANDAG logo at any time to return to the homepage. made in order to view or export your report. Are you looking for census, estimates or forecast information? Which time period or series are you looking for? Which district or community are you researching? Which specific area in the GEOGRAPHY TYPE are you researching? Click to quickly see an interactive summary of your data. information or the orange plus button to interact with the data. to export a PDF Document (PDF) or Microsoft Excel (XLS). Send a download link of your report. Download the report directly to your desktop, smartphone or tablet. Document (PDF) or Microsoft Excel (XLS). *Note: Additional location information selected will not be reflected in the Interactive Data summary. apply and then export your report.